Ruby Tuesday are a two-piece guitar and drums group from Manchester. 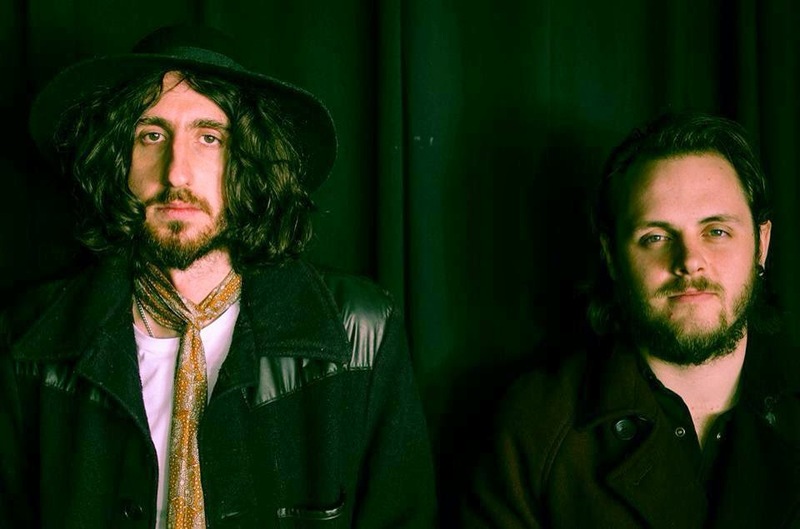 They recently released a new EP The Devil's Roulette and sold out Kraak Gallery in town. We spoke with guitarist Jimmy McCarthy about their past, the EP and the inevitable (and lazy) comparisons. First of all can you introduce Ruby Tuesday and explain how you got together as a two piece? Ruby Tuesday started as a break away from a four piece heavy psych band in 2011. Me and Joel have been in bands together for around seven years but mostly playing drums and bass, keeping our heads down and just doing what we needed. I found the direction of music and personalities in the band weren't going well and a mutual friend suggesting trying out something with the two of us. I didn't know what to expect but decided we will right the music that feels most natural. We never picked a genre to go for and didn't want to purposely sound like another band or style just to fit in a cool clique and be liked by the cool kids of town which admittedly I've done before. We just jammed and before we knew it we had seven or eight tracks and were ready to gig. We soon recorded a ten track album called The Rebellion Interlude in one day at the studio which we released ourselves digitally for six months only. The name came from a book of the thousand greatest songs and whilst lazing around at my old flat Joel opened it up at the page and said let's be called Ruby Tuesday. At the time we didn't know our sound or have any idea of what we would become so it fitted well at the time. Little did I know we would never be found on a google search due to thousands of Stones covers but I sort like that. Our sound can probably be best described as filthy, dark, bold and in your face. I struggle to put us in a category so I just go off people's reaction. One comment that has always stuck in mind was at one of our early gigs. A women came up to us after and said "your music just makes me want f@"k!" I didn't know how to take that but in a strange way it describes our music perfectly. As a two-piece there are inevitable comparisons with The White Stripes and Royal Blood. Does that frustrate you and how would you counter someone making that easy link? As a two piece we do get compared to The White Stripes, Death From Above and more recently Royal Blood thanks to commercial radio stations loving every note they play and the making nice the art of alternative music. It does get frustrating as our first two singles Heartbeat Of A Heartbreaker and Smoke Rings nearly four years ago were like a dancier more angrier royal blood tracks. We do get compared to other two piece bands but we've learned to shrug it off. We never set out to be a two piece. Me and Joel just rehearsed and it was best this way. I think it takes a lot of confidence to be in a duo band. When I'm playing guitar I feel exposed as there's no one to hide behind if I make mistake, every gig and every track has to be the best I've played or it will show. You've just released your EP Devil's Roulette and put on your own launch gig. What are your immediate plans to continue to promote it? Yeah we have released our latest EP The Devils Roulette last month. We worked with Moolah Rouge on recording and producing the EP and was completely self funded by me and Joel. It was a long process in which nearly twenty tracks were recorded and after a lot of to and throwing a final six were picked. As it was self funded unfortunately there isn't a money tree for us so as advertising the EP we are mostly gigging and hope we impress to sell the EP and going for good old fashioned word of mouth. Social media is always good but can only take you so far. Luckily we have a healthy fan base so it's good that word is spreading. We had a fantastic gig for the single launch and restored my faith in the modern day music scene and that alternative music is alive and well. Could you walk us through the tracks on the EP and tell us a little about each one please? Sell Me Out. This song derived from a jam me and Joel had. Each time we rehearse we just play and see what comes from it. It was written in one rehearsal. I was inspired by The Gossip's first album. Some of the raw bass lines on that album are brilliant. Joel's drumming on this track for me is one of the best. It's dance mixed with heavy rock and flows so well, it's really aggressive. The drums definitely make it into a Ruby Tuesday track. Weapon At The Door is the oldest track on the EP. It's mainly just riff based on guitar, swapping between two different blues riffs throughout. Joel's drums swap from dirty to rock to dance beats which really defines the track for me and sends you on roller coaster journey of ups and downs. This is the first track Colin from Moolah Rouge got involved with instrument wise and took some guitar riffs out and replaced it with clavinet which created a Doors style bass and organ sound. This for me improved the track and made it stand out from other bands. Stargazing is a fast upbeat rolling track, again with lots of ups and downs. The drumming is furious. It has changed a bit on guitar and even now live it's different from the EP. That's the beauty of a two piece, as long as you read each other live you can do what you want. This is the only track on the EP I put bass guitar on. I felt a fuzz bass was necessary to take the track where I wanted it to go. We also added samples of thunder rain and a child singing Twinkle Twinkle Little Star on it to. Sounds rubbish but it's amazing how scary an eight year old girl can sound. Let People Go is the slowest and most laid back track on the EP. The lyrics were taken from an old track off the same number but admittedly it was a little close to Led Zeppelins Since I've Been Loving You so we started again. It's basement blues at its finest and is probably the track that splits mine and Joel's influences the most. The verse is laid back with a basement blues riff which is right up my street and the chorus is hard hitting grunge which is what Joel is all about. Fall is taken from our dark moments and us in a angry state. It's in your face and when we recorded it we didn't want to mess about. It's fuzz, dark and hard hitting. I had The Stooges in mind when I wrote the riff but after a few rehearsals in turned into more than we could of hoped for. Fools In Belief is a old track that's straight hitting rock. No nonsense, no massive changes or anything to technical. Just two and half minutes of rock. Ruby Tuesday's website can be found here and they are on Facebook and Twitter. The EP can be purchased from their Bandcamp site.